my little red suitcase: sparkle. There's that tipsy fairy at the top again! 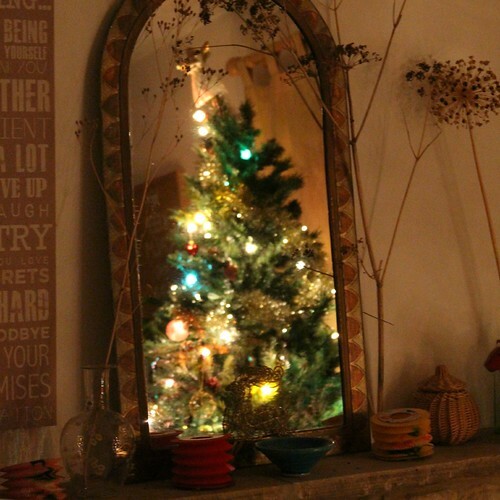 I love my old Woolworth's tree, lots of tinsel and a string of vintage lights. It's bringing so much comfort right now. Today has been a course of events that I could never had imagined this morning. A neighbor's visitor falling on the slope outside our houses. Waiting for the emergency services. Trying to provide comfort and warmth. The amazing coincidence of a passing RAF helicopter rescue pilot, in his car, who worked with the first responder and calmly took control of the situation. Sometimes when things happen, absolutely the right people have been placed in position to help. Four years ago on Christmas Day I fell over and broke my leg. A tale for another time, but basically I was walking my dog, it was getting dark and frosty when I slipped over. I was on my own, although a car stopped. I remember how cold and shocked I felt on the floor. It felt good to be able to help in a way that I understood was needed and re-assuring to see it being handled in such a professional way. The patient is safe and warm in hospital now, but he will need an operation on his hip and wrist tomorrow. good to know that your neighbour was assisted so well!!!! What a generous thing to do Heather !